Hydrilla verticillata (hydrilla) is a perennial aquatic plant (family Hydrocharitaceae). It has been observed in the Mojave and Colorado deserts, south and central coasts, San Francisco Bay Area, and Central Valley. 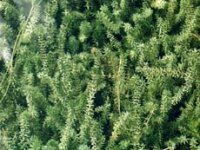 Currently, isolated infestations of hydrilla are found in Shasta, Yuba, Lake, Calaveras, Madera, Mariposa, and Imperial counties. Hydrilla forms large mats that fill the water column and can block or severely restrict water flow.